Monday I brought you homemade graham crackers. Well, nothing goes better with graham crackers than marshmallows. That’s right. 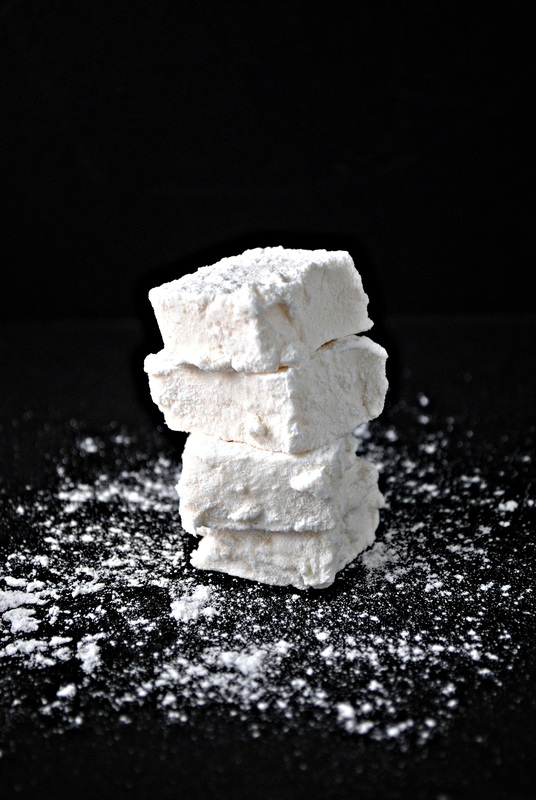 I made marshmallows, a food DIY project I’ve been meaning to attempt for some time. This is another recipe from Jam it, Pickle it, Cure it and Other Cooking Projects by Karen Solomon, which I can’t say enough good things about. Marshmallows are one of those things that that are hard to imagine homemade – they come in a bag and you use them to make s’mores, or to go with hot chocolate. But what are they actually made of? I never put much thought into it. Now I can tell you that marshmallows are made from corn syrup, sugar, and gelatin. Yup. How does that combination yield something that is light and fluffy and delicious? Magic is the only answer. Making them really is a kind of alchemy. You allow the gelatin to soften in water while you stir corn syrup and sugar to 240F. Then you add that to the gelatin along with a bit of vanilla and stir, stir, stir until it turns into a thick, white, sticky substance (watching the transformation is the magical part). Pour that into an oiled baking pan and allow to set. That’s it. I really recommend using a stand mixer if you have one, but I am proof that it can be done the old-fashioned way. With my husband’s grandmother’s hand beater and a fair amount of elbow grease (ok, my husband and I took turns), we whisked our way to marshmallowocity. I know the holidays have passed, but these make incredible gifts any time of year. They’re also fabulous just to have around. Making marshmallows at home is easier than you think. And once you try these fluffy little pillows it'll be hard to return to store-bought. Lightly oil the inside of an 8 by 8-inch pan (mine was slightly bigger) with vegetable oil. Generously coat with confectioners' sugar and set aside. Pour ⅓ cup of the water into a bowl. Sprinkle the gelatin over the water and set aside. In a saucepan combine the remaining ⅓ cup water with the sugar, corn syrup, and salt. Place over medium-high heat and cook until it reaches 240F on a candy thermometer. Very carefully add the hot syrup to the softened gelatin. Spread the mixture into the prepared pan using a lightly oiled spatula. Set aside for at least 1 hour, or until the marshmallows are firm and cool. Run a wet knife around the edge of the pan to loosen the marshmallow sheet and remove it from the pan. Using a sharp, wet knife, cut into squares. Toss each marshmallow in the confectioners' sugar until completely coated (or use cocoa powder or shredded coconut!). Store separated by parchment or wax paper in a container. They should keep for at least a month. Do not refrigerate. Glad you guys are keeping busy over there — and I’m impressed that you beat these by hand! There aren’t any gelatin-free marshmallows sold in Israel, so we can’t buy them … and the one time we did find vegan marshmallows, Eitan didn’t even like them! But if we ever want to have marshmallows again, I’ll probably have to make them. Huh! I was under the (naive?) assumption that because the gelatin I purchased was parve that it must not contain animal products. Some quick research just showed me that is not necessarily the case…so interesting! And confusing. Thanks Shannon!! It was way easier than I thought it would be! And yes, if you have a mixer, I definitely recommend going that route!! Amazing. The picture is beautiful too! Fun recipe! Never thought to make them. And it looks like a pretty easy recipe. Nice pictures – particularly the marshmallow stack. Thanks! I’ve had it in my head to try making them for some time and was pleased at how simple the process was! Of course, there’s no escaping the fact that they are made of corn syrup and sugar, but that’s the way things go. My sister was telling me about her book!! Thanks for the link, I want to try her recipes! Her marshmallow recipe is different from this one, next time I’ll try it out. How fun – and I bet there’s absolutely no comparison to store bought varieties! It’s true! They are so much better than store-bought. I’m typically not a fan of packaged marshmallows but these are so much better! And really fun to see them come together. I’ve never even thought of making marshmallows! It looks like fun, and I’ll bet they do taste better. Thanks for sharing. Happy New Year Katherine! Looking at your DIY recipes make me convinced that I’m a super lazy cook. I get store bought marshmallows and never even thought of making it from scratch. You are such an amazing cook! Thanks for sharing this recipe Katherine. They are not very popular in India hence not easily available. But I was always intrigued with their texture and their taste when I saw them being used in baked goods. You are welcome! I can imagine they are not big in India. They have a wonderful texture, especially the homemade version, which is more pillowy and light. Katherine, this looks so tempting! Can I substitute corn syrup with anything else? We don’t get this ingredient in Hong Kong. Thanks Cate! Hope they turn out 🙂 They’re super fun to make! I tried your recipe (which is delicious, by the way!) but I’m having some (a lot) of trouble getting it fluffy enough. The first time I tried it was with a hand mixer, but my poor thing started to overheat after about 3 minutes, it had gotten so hard that I could barely wrestle it out of the bowl, and came out kind of “gummy worm” consistency. The second time I tried it (with less gelatin, interestingly enough the 1/4 oz packages are closer to 1/2 oz) I used my brand spanking new stand mixer, and that worked better, but still never aired up enough, no matter how long I left it on. I’m thinking next time I might try it with the hand mixer over a double boiler, so the candy portion doesn’t seize up so much, but I’m worried that that might have some unintended effects. Any advice for a complete novice? I just got a candy thermometer today and can’t wait to try to make these! No such luck. 🙁 It never went past the taffy stage. But I will try again with more gelatin and a scale. If it works, may I post on my blog? Oh well! I’m glad you’re going to keep trying 🙂 I would love if you posted about it on your blog, that would be awesome! Let me know when you do!